The Office of Student Affairs recognizes outstanding students, student groups, and student organizations every year through the Student Leadership Awards. These awards aim to celebrate significant student contributions which have enhanced campus life. The Awards Reception is on Wednesday, April 17, 2019 at 4pm in the GSC MPR. The Office of Student Affairs’ Awards and Recognition Committee will accept nominations from students, faculty, and staff of all the Claremont Colleges. 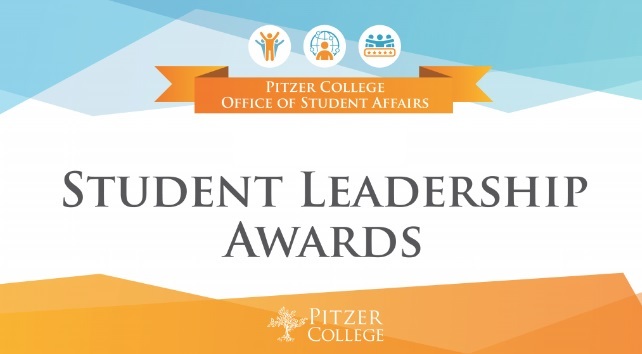 The Pitzer leadership groups will review nominations and provide recommendations to the Office of Student Affairs’ Awards and Recognition Committee. Winners of the awards will be informed in early April and the entire community is invited to the awards reception in April celebrate our winners and to recognize student leadership across campus. There are five awards categories for which students can be nominated. These categories were inspired by Pitzer’s Five Core Values. You can read more about each award category below. At Pitzer College, students spend four years examining the ethical implications of knowledge and individual responsibility in making the world better. They learn to evaluate the impact of individual and collective actions manifested in social and political policies. The Social Responsibility Award Recognizes an individual student, student organization, or particular initiative whose engagement in the community is especially impactful. The student(s) selected to receive this award will have demonstrated the highest standards of professional and ethical conduct and address social justice issues when negotiating engagement in the community. Some possible examples: community service efforts, campus club that contributes to the Pitzer or greater community, tutoring Pitzer staff members, donating food to local food banks, advocating for the good of the community (gender neutral restrooms, etc). Intercultural Understanding enables Pitzer students to comprehend issues and events from cultural lenses beyond their own. From Los Angeles to Botswana to Nepal, Pitzer students are educated to thrive and succeed in an ever-changing global community. The Intercultural Understanding Award recognizes an individual student, student organization, or particular initiative who have demonstrated a commitment to viewing the world and its history from another’s cultural lens. The student(s) selected to receive this award will have demonstrated a personal commitment to cultural understanding as well as promoting this core value on Pitzer’s campus through programming and collaborative initiatives with faculty, staff, students, and other 5C entities. Some possible examples: responsible research practices, study abroad work, connecting others with their own culture, work with cultural and identity centers (OBSA, CAPAS, CLSA, etc.). Pitzer College students are taught to challenge traditional ways of learning and to make immediate connections between academic disciplines. Faculty is organized by field groups instead of traditional academic departments. Scientists, sociologists, historians, writers and artists influence each other’s work and often teach courses together. The Interdisciplinary Learning Award recognizes an individual student, student organization, or particular initiative who exemplifies the cross disciplinary approach to involvement on-campus. The student(s) selected to receive this award may have created with other clubs, staff, faculty, offices, and outside presenters to enhance campus life and facilitate outside of the classroom learning. Pitzer College encourages and inspires students to engage fully in their own development and in all aspects of the life of the College. Students have the flexibility to direct their own educational and career paths and are active members of college governance, including making decisions on everything from academic policies and faculty and staff hiring to public art displays and building design. The Student Engagement Award recognizes an individual student, student organization, or particular initiative that has increased the level and quality of student engagement in the life of the Pitzer community. The student(s) selected to receive this award may have facilitated meaningful engagement by either broadening the scope of student engagement or by deepening the engagement of other students around a particular issue or initiative. Some possible examples: A new club that addresses student needs/interest, bringing speakers to campus, innovative events to bring awareness to issues, revitalizing and re-engaging the community. Sensitivity for and preservation of the environment are key values of Pitzer College. Campus landscaping utilizes drought-resistant, native plants and the College is proud of its many LEED-certified sustainable buildings. Students shape their daily activities, programming and studies to ensure they leave the environment and the world stronger than how they found it. Students interested in environmental issues will find Pitzer an exciting living and learning laboratory. The Environmental Sustainability Award recognizes an individual student, student organization, or particular initiative who has worked to advance sustainability on-campus and in the community. The student(s) selected to receive this award may have been involved in sustainability-related groups, participated in campus initiatives and college governance. Some possible examples: sourcing food and learning about the process, composting efforts, upkeep and work with the community garden, issues around food justice, water conservation, efforts with the Robert Redford Conservancy.